This series of posts follows the steps required in order to make your own Netduino GO! module. To do this we are using a simple idea, an Output Expander (yes, it seems to have a name now) for the Netduino GO!. Using only a hand full of simple components, the Output Expander will add 32 digital outputs to the Netduino Go!. The first batch of 10 boards were ordered on 20th April 2013 using iTeads prototyping service. I am expecting the manufacturing process to take about one week with a further two weeks for shipping as I used the cheap, slow courier service. In the meantime we still have the breadboard prototype to work with. This may only have two shift registers attached to it but by carefully parametrising the code we should be able to develop a driver which only needs to be recompiled when the final hardware becomes available. Some of the code is better left on the Netduino GO! with the base features (setting all of the register values etc) being implemented on the STM8S. Initialisation should allow for the use of cascaded boards. If you look back at the schematic you will notice a connector called CascadeConn. This connector allows the addition of a simpler board as an expansion module. This board only need to supply additional shift registers leaving the first, main board supplying the logic to communicate with the Netduino GO!. The concept is that if you want 64 outputs then you would have a single Output Expander module with a single, cheaper daughter board. In order to support the addition of the daughter board the initialisation will need to support the specification of the number of shift registers in the cascade. In supporting the cascading of these boards we will also need to provide some sensible default values. The basic case is a single board which contains four shift registers. Power considerations – all of the power for the shift registers is being provided by the Netduino GO! Data packet size – the data packets used in the GoBus are fixed size. Keeping the number of shift registers to a value where only one data packet is required simplifies the communication between the Netduino GO! and the module as a single packet can be used for all messages. In order to facilitate this we will need code on both the Netduino GO! and the module. The code on the module should allow for the number of shift registers to be set up (assuming a default value of four registers) and then clear the registers. The default code should be called when the module is re-initialised. //  GO! function 3 - Set up the module. //  Next, set up the space to store the data. Setting the outputs is simply a case of sending a number of bytes, one for each shift register to the module. 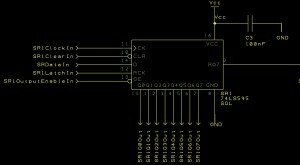 /// Set the shift registers using the values in the byte array. //  GO! function 2 - Output the specified bytes to the shift registers. /// bit in the shift register. Not only is the former example more elegant but it is also more concise. /// module to indicate that it has received and executed the command. This method could have been rewritten to set the values to 0 and then send the values to the module. However, the prototype already had an implementation of a clear command and so this was left in as is. In this case we would set bit 2 of the lower shift register followed by bit 3 of the same shift register. Because of the speed of .NETMF there would be a slight delay between the two outputs of the shift register being set high. In order to allow for this we introduce the ability to delay the latching of the data from the internal shift register into the output register. /// Determine when the data should be sent to the module. /// Automtically send the data to the module as soon as there are any changes. /// Manually latch the data. /// Backing variable for the LatchMode property. /// automatically send data as soon as there are any changes. The introduction of the LatchMode means that we also need to allow for the data to be latched into the shift registers. /// Call the Set command on the module to set the outputs of the shift registers. The above method simply sends the data to the module. We can perform some simple testing of the software while the prototype boards are being made by using the breadboard test environment build in the first post. This board only has two shift registers but it should be possible to test the majority of functionality using this board. The code has been carefully written so that we should only need to change two parameters when the final PCBs arrive in order to change the drivers from two shift registers to four shift registers. A quick test has shown that the main functionality appears to be working on the breadboard prototype as demonstrated by the above video. The prototype PCBs have completed manufacture and are currently with the Hong Kong postal service (as of 27th April 2013). Delivery should take another 7-10 days so there is plenty of time to complete the test suite. 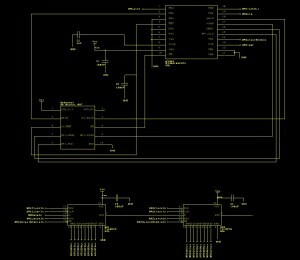 The next stage of the process is to convert the schematic into a PCB. This part of the process is the one which is totally new for me and so is the one which has the greatest chance of going wrong. This is where we will find out if my research is good. 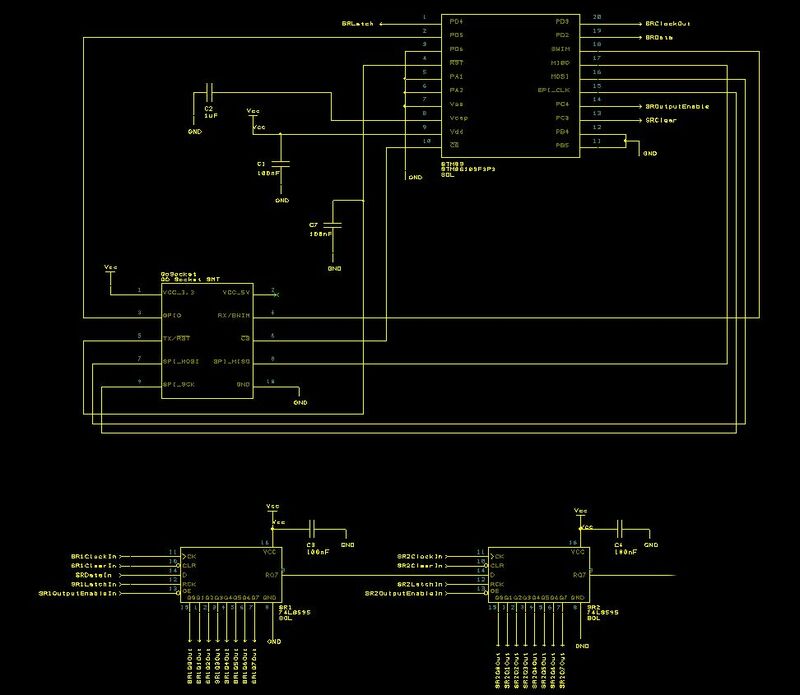 The PCB layout process converts the schematic into a representation of the board which can be edited using the PCB layout tools. The layout can appear confusing as it is a layered version of the final board. Different colours map to the layers / artefacts on the board. It is this layering which can appear confusing at first. It is suggested that the above process is completed in order as each step adds new artefacts to the board. As noted earlier, the schematic and related files are being created using DesignSpark PCB. The processes being discussed are relevant to PCB manufacture in general. The ratsnest in DesignSpark’s PCB editor shows each component in the footprint it will occupy on the final board. The logical connections between the components are also shown as simple lines between the pads which will be used to mount the components. The lack of structure of the output gives the representation it’s name as it looks like a disorganised rats nest. The connectors should near to the edge of the board to allow the board to be connected to the Netduino GO! and external circuitry with ease. The shift registers and microcontroller can be placed anywhere on the board as we are looking at a low speed, simple board. Placement is more critical for more complex boards. For this board it is logical to place the shift registers near the output from the board as they will used to provide the 32 outputs for the board. It is also logical to place the microcontroller near the Netduino GO! connector as it is receiving instructions from the Netduino GO!. There are also a number of passive components on the board. These provide some signal filtering and power stabilisation. These components should be place as close to the chip they are supporting. For instance, each of the shift registers has a 100nf capacitor between power and ground. This capacitor provides a buffer for power spikes and it should be placed a close to the chip as possible. There are similar capacitors near the STM8S microcontroller. So the first step is to take the components and break them down into the logical groups. You can then deal with each group in turn. The major components are shown along with the connections between the components. This appears a little disorganised at the start as the yellow lines showing the connections between the components run in a straight line taking the most direct route. Routing is the process of placing copper connections between the components. So at this point you should have the components in their final resting place. If you have to move them later then you will disturb the routing. It is not too big a problem as you can always break the connection and then re-establish it with a new copper track. The next thing to consider is that for this simple board there are two types of tracks, power and signal. In DesignSpark PCB these are also broken down into two subcategories, nominal and minimum. Where possible I have always selected the nominal connection for both power and signal. You should also remember that it is possible it define your own track type. When connecting components DesignSpark PCB is reasonably intelligent and will take the connection type from the schematic and apply this to the PCB layout. By default this will be the nominal connection for either power or signal. Like many PCB layout packages, DesignSpark PCB provides an auto-router. In my experience these take a long time to run and does not always provide a complete board (i.e. they fail to completely route the board) and they also need a reasonable amount of computing power to complete. 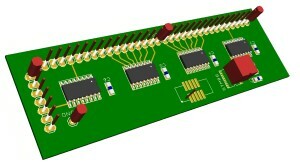 For a small and simple board like this one I have always found that manually routing the board is the preferred option. Routing also requires a change in the way of thinking about the board. PCB manufacture is a multi-layer process. The simplest for home manufacture is a single layer. This board can use two layers as this is relatively standard for low cost. Two and four layers are becoming common in the low cost prototype market. Larger numbers of layers are also possible but are currently too expensive and complex for the hobbyist. The simplicity of this board only merits a two layer board which also helps to keep the production cost lower. Red traces are tracks which will appear on the top layer of the board. Cyan traces are tracks which are on the lower layer of the board. Thick tracks are used to carry the ground and power signals. Thin tracks carry signals between components. Small yellow circles in the tracks are vias (interconnections between the top and bottom layer of the board). Component outlines are shown in yellow. These represent the physical size of the component when it is mounted on the board. This will also appear on the top layer silkscreen. The green parts are represent the board outline and the mounting holes for the board. All of the changes in direction of a track are mitred rather than simple right angles. You can see that the board still contains some very thin yellow lines from the original ratsnest. These lines represent the connections which have not been routed yet. A quick check of the connections shows that all of these pads are connected to ground. These pads will become connected when the ground plane is added to the board. The final routing task is to add a ground plane to the top and bottom of the board. Now the routing is complete we can return to the additional artefacts on the board. The first and possibly the most important is the board outline. The original outline in the image above was used to give an indication of the maximum ideal board size (10cm x 5cm). Most of the Netduino GO! modules released so far have had rounded corners. So the board outline was replaced by a board with rounded corners. The next check was to look at the silkscreen layers. These already contain the component outlines along with some names. Some useful additional information includes pin names for the connectors along with some information about the board – a name perhaps. A final note about the mounting holes. These should be placed on a 5mm x 5mm grid in order to achieve GO! certification. The holes should also be 3.1mm – 3.3mm in diameter. One limitation I found with DesignSpark PCB is the fact that you cannot place a logo/image in the silkscreen layer (or any other layer for that matter). This is a major limitation of the package. It appears that the solution is to create a font containing the image and then add text to the silkscreen using the font which has been created. For a package which is currently at version 5 seems to be a major omission. The final step in the design process before going to manufacture is to verify the board and determine if the board can be manufactured successfully. Firstly, print out the board. Now double check the connections making sure that all of the pads are connected correctly. A print out is more useful to me as I can take it away from the screen and start to tick off the pads I believe to be connected correctly. The list is much larger but you get the idea. I found that the values used for some rules was too cautious and would not let me route some tracks correctly. I had to change the default rules using values from the manufacturer I had decided to use. Rerunning the check with the new minimum values for track spacing allowed the board to pass DRC. One thing to note is that there is nothing to represent the board outline. This has been added to the top silkscreen layer as requested by the manufacturer I have chosen. The Gerber files are simple text files which contain instructions for the CNC machines used in the manufacturing process. Now we have the Gerber files it is useful to check that they look right. Luckily there is an on-line Gerber viewer. Uploading your files will allow you to check that the image generated matches the design and layout. Note that the GND pin to the top right of the board has four tabs connecting it to the ground plane. The past 12 months have seen a number of PCB companies offer a low cost prototype PCB service. These services allow the production of a number of board (typically 10) starting as low as $10 for 10 5cm x 5cm boards. Some services even give you extra boards if you open source the hardware and hence allow them to add the board to their online shop. The number of PCB options may be limited (i.e. silkscreen colour etc.) but this certainly makes the cost of production viable. For instance, a 5cm x 10 cm board costs less than $30 including shipping to the UK for 10 boards. Our module has been designed to just fit within the 5cm x 10 cm footprint. Another service for the hobbyist or prototype developer is that offered by Batch PCB. This company collects the production files from customers and creates a single panelised board containing one or more customer designs. This board is manufactured, the individual boards cut and extracted for shipping to the customer. By doing this the company can offer a low cost production service ($2.50 per square inch at the time of writing) for larger boards. There are a number of other companies offering low cost services for small runs. The companies quoted are ones I have noted over the past few months when I have been looking for low cost alternatives. There will now follow a slight pause in the development of the hardware while the boards are produced somewhere in China. According to colleagues it typically takes about one week for manufacture and two weeks for shipping. In the next post we will look at developing the drivers for the board using the breadboard prototype as our test environment. The next stage in the process is to make the final design decisions and produce a prototype PCB. The criteria as defined in the first post stated that the hardware should provide at least 16 digital outputs using low cost components. The breadboard prototype produced shows that we can certainly control 16 digital outputs using the common shift register. One possible extension is to use more shift registers than were used in the breadboard prototype. This will produce a module with more outputs. A quick look at a local suppliers web site shows that these can obtained for a relatively modest cost. Adding a further two shift registers will take the outputs from 16 to 32. The prototype shows which pin is being activated by a LED. The LED circuit includes a resistor and MOSFET/Transistor to allow the power for the LED to be provided by an external power supply rather than the 74HC595. Doing this allows the use of LEDs which would exceed the maximum power rating of the 74HC595. Although it should be possible to include these components (resistor and MOSFET) in the final design, they will be omitted in order to reduce the production costs. There are also several other packages available but these seem to be the three main packages offering free version of their software. Being a hobbyist price is a critical factor in the choice of software to use. Eagle PCB is available as a free personal edition. The software and licence are both restricted in some way. I have also found the interface to be exceedingly difficult to use. As a long time user of Windows applications the interface in Eagle PCB is counter-intuitive. 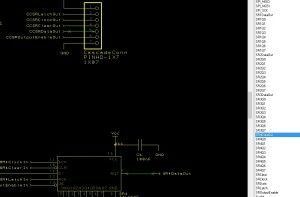 KiCad is free and looks to be well supported but I found the interface difficult to use. DesignSpark looks to be well supported and has gone through several revisions, one major revision in the time in which I have been using the software. DesignSpark is not restricted to producing just the PCB design file but can also render a 3D image of the final PCB. This allows you to visualise how the final board will look. The interface allows the board to be rotated and viewed from an infinite number of points of view. DesignSpark is fairly intuitive to use and there are a number of tutorials and how to guides available and so I will not go into too much detail regarding using the package. There is one tip I would like to give and that is use nets. Now before I discovered how the nets feature works I would have dropped the components for the STM8S and connector on the schematic and then wired them together. 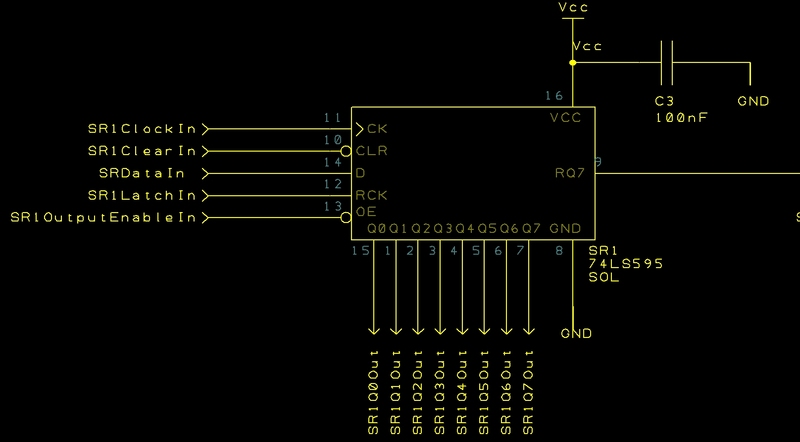 Next I would have dropped the first of the shift registers onto the schematic and started to connect this to the STM8S. I would have then repeated this with the next shift register (connecting it to the first) and so on. The end result would have been a schematic which was difficult to read due to the number of connecting wires. Looking at the above image you should note that the STM8S has two different connections, an un-named wire which goes off to another part of the circuit (i.e. pins PD5, PD6 etc.) and connections which are terminated with a name (i.e. PD3 is connected to something called SRClockOut). The connections which go off of the image are standard interconnects between the various components on the board. These interconnects have been restricted to connecting components in our logical function block (STM8S and GoBus connector). This includes any components required to support the STM8S such as capacitors etc. We have two pins which have two different names but if we were to look at their properties we would find that they have both been connected to the same net, SRClock Shift Register Clock. By doing this the software knows that the two pins are in fact connected. This process has been repeated and a number of nets have been created, some have only two pins on them (the data output from the STM8S – SRData – is only connected to the input of shift register 1), others have several (the SRClock net connected the STM8S clock output pin to the clock input of all of the shift registers). Using nets simplifies the schematic and makes it easier to read. Using a standard naming convention for the input and output pins means that you should always be clear on which pins should be connected. It does add a new task to the design process. With a number of the pins named rather than connected you will need to verify that the pins are connected correctly. The above diagram shows that the net SR4DataOut has been selected; see the blue highlighted name in the list at the right of the image. The green connections on the schematic show which pins are connected to the SR4DataOut net. Checking is then a case of repeating the process for each of the nets and noting which connections are highlighted. 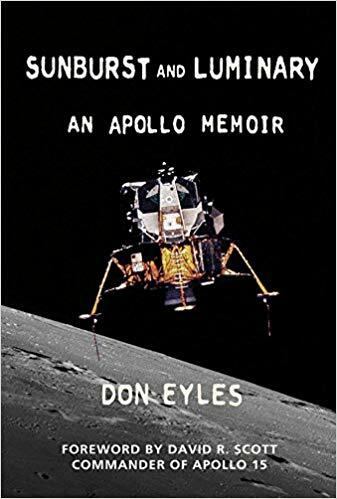 A PDF version is also available as this may be difficult to read. In the next post we shall have a look at taking the schematic and laying out the PCB. In the previous post a prototype for the multiple digital outputs was developed and implemented on breadboard. 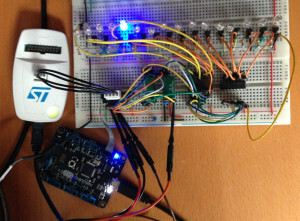 The STM8S code was independent and demonstrated that two chained 74HC595 shift registers could be controlled by bit-banging data through GPIO pins on the STM8S. These two functions are already in the standalone version of the STM8S code and it should be a relatively simple exercise to merge this functionality with the Netduino Go Bus communication protocol. The first task to be completed for the STM8S code is to create a new project and add the code from the post STM8S SPI Slave (Part 3) – Making a Go Module. The two functions should then be removed and the two new ones we are implementing should be added. Start a new STM8S project and save the project into a new directory. Now take the source code in main.c from the project STM8S SPI Slave (Part 3) – Making a Go Module and paste over the code in you new project. Ensure that the project is targeting the correct microcontroller and save the project. Alternatively, copy the project code from STM8S SPI Slave (Part 3) – Making a Go Module into a new directory. The project code in the STM8S module post contained a couple of dummy functions illustrating the concept of module functionality and communications. This code should be removed and the application stripped down to the basics required for SPI communication with the Netduino Go!. The final task is to add the code which implements the new functionality as defined for the basic module (i.e. clear the shift registers and set the outputs of the shift registers). //  Pins which we will be using for output the data to the shift registers. PD_ODR = 0;             //  All pins are turned off. PD_DDR = 0xff;          //  All pins are outputs. PD_CR1 = 0xff;          //  Push-Pull outputs. PD_CR2 = 0xff;          //  Output speeds up to 10 MHz. PC_ODR = 0;             //  Turn port C outputs off. PC_DDR = 0x18;          //  PC3 &amp; PC4 initialised for output. PC_CR2 = 0x18;          //  PC3 &amp; PC4 can run up to 10MHz. //  Initialise the CS port for input and set up the interrupt behaviour. PB_ODR = 0;             //  Turn the outputs off. PB_DDR = 0;             //  All pins are inputs. PB_CR1 = 0xff;          //  All inputs have pull-ups enabled. PB_CR2 = 0xff;          //  Interrupts enabled on all pins. EXTI_CR1_PBIS = 2;      //  Port B interrupt on falling edge (initially). PA_ODR = 0;             //  Turn the outputs off. PA_DDR = 0;             //  All pins are inputs. PA_CR1 = 0xff;          //  All inputs have pull-ups enabled. PA_CR2 = 0xff;          //  Interrupts enabled on all pins. EXTI_CR1_PAIS = 2;      //  Port A interrupt on falling edge (initially). //  Number of registers in the chain. //  Data area holding the values in the register. U8 _registers[NUMBER_OF_REGISTERS];             //  Data in the shift registers. Note that the variable used to store the data in the registers has been converted into a static array instead of a variable sized array using malloc. //  Forward function declarations for the function table. //  Table of pointers to functions which implement the specified commands. //  Clear the shift registers. //  GO! Function 1 - Clear the shift registers. Note that the functionality has been implemented using two methods, the first ClearRegisters is the internal implementation. This is independent of the Netduino Go! communications and allows the functionality to be called in say the initialisation code of the module. The second method, ClearShiftRegisters is the method which is called by the code as determined by the Netduino Go! driver code. This has the additional output and notification methods which actually sets the data in the shift registers and sends a signal back to the Netduino Go! to let the board know that the request has been received and processed. Note that this split is not necessary but is a design decision taken for this particular module. The code should be ready to compile and deploy to the STM8S. At this point we should have one half of the communications channel ready to test. The second stage is to implement the driver on the Netduino Go!. As our starting point, we will copy the code from the BasicGoModule class in the post STM8S SPI Slave (Part 3) – Making a Go Module into a new class OutputExpander. We will modify this to add create new functionality to clear and set the shift registers. /// Command number for the ClearShiftRegister command. /// Command number for the SetRegister command. /// attempts to write the data before throwing an exception. //  the command has been executed correctly. //  No response within the 5ms so lets make another attempt. By making this change we are also making the assumption that the signal back from the module (via the interrupt) is always indicating success. This is a decision which is appropriate for this module but may not be appropriate for other applications/modules. Before adding new functionality it is necessary to remove the existing AddFive functionality from the BasicGoModule. At this point we should be able to add some code the Main method of the application to test the module. We will perform something similar to the code in the previous post, we will move a single LED but this time we will illuminate the LED starting a position 15 and working down to 0. This should ensure that we have deployed new code to both the module and the Netduino Go! board. Output Expander Connected to Netdunio GO! You can just see the Netduino Go! in the bottom left corner of the video. One thing that did become apparent during this part of the process was that both the STM8S code and the Netduino code can be improved by improved grouping the functionality. For instance, in order to add the methods to the function table in the STM8S code I had to jump around the source code a little. The next step in the process is to look at the hardware and start to prepare for prototype PCB manufacture. So the first stage in the development process (now we have the concept) is to develop a working prototype on breadboard. This will show if we can make the hardware and software work as we want to achieve the desired goals. 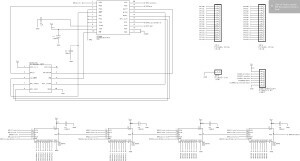 For the first stage we will connect up a single 74HC595 shift register to a STM8S chip and write some software for the chip. 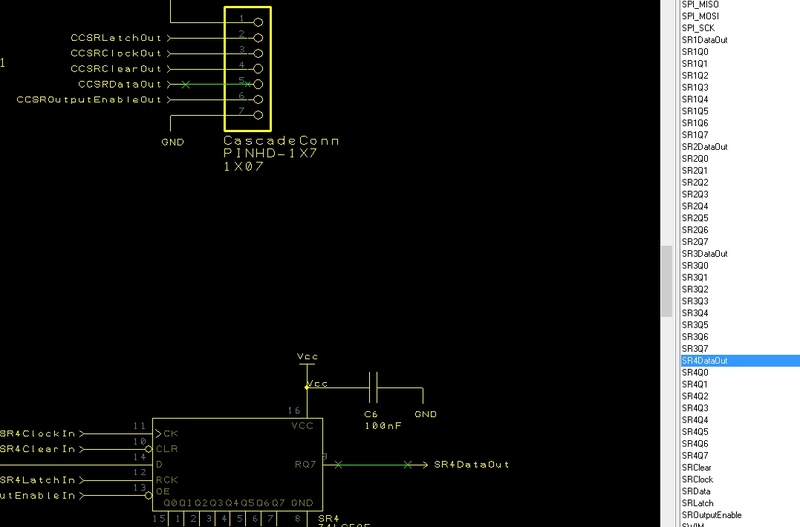 We are not going to consider connecting the STM8S to other chips/controllers at the moment, we are simply going to output some known data to the shift register and see how it responds. As this is a simple digital output board we can show the output from the system by using some LEDs. This will also allow us to test one of the secondary objectives, namely the ability to control a reasonable amount of current. The standard 74HC595’s will supply/sink up to 25mA per pin. However, the chip is only rated at 150mW. Turning on all of the pins will over drive the chip. So to get around this we will drive the LEDs through a transistor/MOSFET. The serial input lines of the 74HC595 lend themselves to the using the SPI bus in order to send data to the shift registers. We will not be able to use SPI in this case as we will need to reserve this for communication with the Netduino Go!. Visual output from the shift registers will be provided by a number of LEDs. In order to reduce the current drawn from the shift registers the LEDs will be driven by a transistor/MOSFET. A small application is required to test the circuit. The first stage is to verify that the STM8S can communicate with the shift registers. The application will simply turn on the various LEDs connected to the shift registers in turn. Firstly, we need some #define statements to make the code more readable. //  Clear all of the bytes in the registers to 0. //  BitBang the data through the GPIO ports. //  the registers and setting the clock and data lines into known states. SR_OUTPUT_ENABLE = 1;               //  Turn off the outputs. SR_LATCH = 0;                       //  Ready for latching the shift register into the storage register. SR_DATA = 0;                        //  Set the data line low. SR_CLOCK = 0;                       //  Set the clock low. SR_CLEAR = 0;                       //  Clear the shift registers. SR_CLOCK = 1;               //  Send a clock pulse. //  Set the clock line into a known state and enable the outputs. SR_LATCH = 1;                       //  Transfer the data from the shift register into the storage register. SR_OUTPUT_ENABLE = 0;               //  Turn on the outputs. //  PD3 and PD2 are used for the serial data going to the registers. //  Configure Port D for output. //  registers. Configure Port B for output. PC_ODR = 0;             //  All pins are turned off. PC_DDR = 0xff;          //  All pins are outputs. PC_CR1 = 0xff;          //  Push-Pull outputs. PC_CR2 = 0xff;          //  Output speeds up to 10 MHz. //  Main loop really starts here. At this point we have proven that the STM8S can be connected to the shift registers and we can turn on one of more LEDs connected to the output of the shift registers. The next post in this series will connect the STM8S to the Netduino Go! and present a basic driver for the Netduino Go!, enough to illustrate that the Netduino Go! can control the shift registers. This series of posts will examine the activities required to take the concept of a module for the Netduino GO! through to production. Work with the Netduino GO! As you can no doubt see, this is a reasonably simple project and with the exception of cost, we should have no major problems reaching the objectives. The most obvious solution to this problem is to look at using 74HC595 serial to parallel chips. These are cheap components and the techniques needed to solve this type of problem are tried and tested. The project definition looks like the counting example which is discussed in the Counting Using 74HC595 Shift Registers post with the addition of the Netduino Go! functionality. 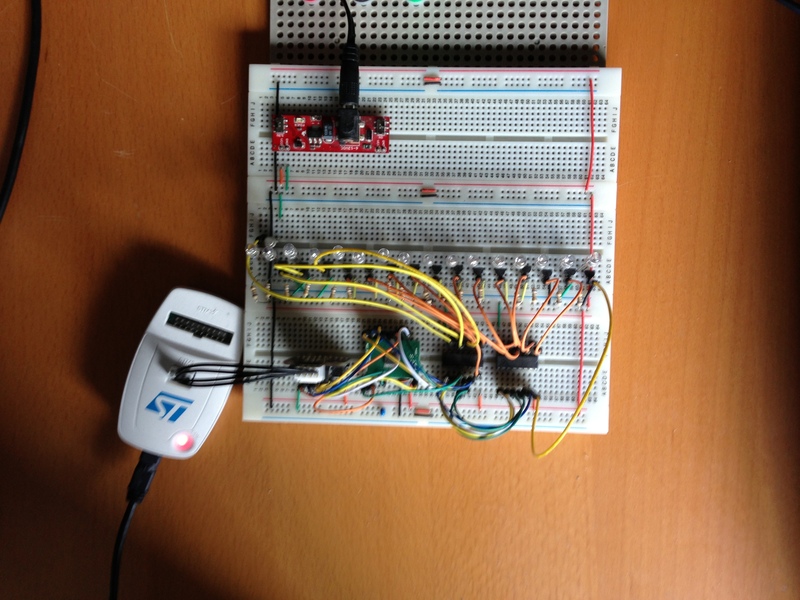 The first post in the series will build the breadboard prototype and start to control the LEDs using the STM8S.